When Rita Cushnie showed up at the RCMP detachment nearly four years ago and was interviewed in regards to the killing of John Radocaj, she had exactly $1.87 in her purse. Over the four-year life of the criminal case, she reported to RCMP for bail management exactly 187 times, her lawyer, Mike Cook told Justice Colleen Suche last night. It was a coincidence revealed just before Suche handed the 57-year-old a life sentence without parole for 25 years after a jury convicted her of first-degree murder and conspiracy to commit murder. One-Eight-Seven: The cold irony for Cushnie, I guess, exists in how those digits have also been co-opted by the gangster underworld as a kind of shorthand for the crime of murder. The slang use stems from the California Penal Code, where capital murder with malice falls under section 187 (a). Winnipeg has already woken up to the news that Cushnie, her (former?) 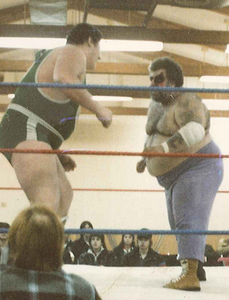 friend Melody Sanford and her son, Donald Richard were found guilty of the brutal murder of the man once known as “The Croatian Giant” in the wrestler’s ring. I’m told it’s been a number of years since Radocaj — a large man standing 6’ 8” — ever stepped into the fray. Since the late ‘80’s. As it is with the media, the ‘ former pro wrestler’ angle became a kind of thin trope to familiarize the public with the case and try to keep their interest (mea culpa). But at the end of the day, ‘Big John’s’ murder had nothing to do with the faded glare of the spotlight or past athletic acclaim. Instead, what I can surmise is that Radocaj was just a man who was duped into possibly believing he could have a second chance at love with a woman he had known for years who clearly now hated him for some still-unknown reason. That’s the story of this trial that largely went untold. As always, the “why” is elusive when it comes to crime and trials. For prosecutors, the “why” is seldom a question worth delving into, because that’s not really the job. The “who,” “when” and “how” are all that’s needed to secure a conviction, it seems. It’s probably safe to say Radocaj’s belief in redemption cost him his life in the most brutal way. A life lost for the promise of a few (and I do mean but a few) bucks and a TV set. His estranged wife, Sanford and Richard (The orchestrator and executioner) each had the insight to recognize early on that they were culpable in the man’s death. Their lawyers even admitted as much in closing arguments where they each said in open court manslaughter convictions were probably a foregone conclusion. In Cushnie’s case, however, she had the most to lose, and obviously felt she was sucked into to something that spun out of any sort of control she may have had over things. Cushnie appeared to break down prior to the jury entering the courtroom. Once the verdict was delivered and the jury had left the room, her tears turned to rage. As the public were escorted out of the gallery and Cushnie was taken into custody for the first time since her arrest, her anxiety spilled over. “No!” the elderly and frail-looking woman exclaimed, apparently in sheer fright as the female Sheriff approached with the handcuffs. “Stop it,” the Sheriff barked back at her. “I didn’t encourage him,” she said, an obvious reference to her son. If her conviction is ultimately upheld (I’d expect a swift appeal) she won’t be eligible for parole until age 82. At least two jurors — one in particular — were visibly distraught as their decision was read by the foreman last night. By my count, all but two stayed for the sentencing portion and reading of the victim impact statements. From behind the jury room door upon their exit, loud sobbing could be heard. Justice Suche declined a request from the defence to poll the individual jurors as to the unanimity of their decision. It’s in her discretion to do so, and she stated she had no reason to question the verdict. The decision sparked a short exchange between her and John McAmmond (Richard’s lawyer), who seemed adamant to put the discomfort of the two jurors on the record. Just moments before the jury portion of the trial got underway roughly two weeks ago, the defence rose to raise a point. Suche ordered her to cover it up prior to the jury seeing it, deeming it prejudicial. I point readers of this blog to this curious story I wrote regarding the case dating back to May 2009. Even at that time, Sanford was ready to accept responsibility for the conspiracy, possibly explaining the resigned expression she wore during much of the trial that I was able to witness. From what ever could tell, no abuse of process argument went forward from her lawyers, or it was done in the background. But we’ll never know what piece of evidence came in that changed the Crown’s position to charge her with the actual killing more than a year after the conspiracy charge was laid. There are two other accused in the case that have yet to deal with their charges.